In one week, the Great Barrier Reef Marine Park Authority will make the final call on whether to allow millions of tonnes of toxic dredge spoil to be dumped in Reef waters. Environment Minister Greg Hunt has already given his approval, and now the Reef Authority is the last group who can stand up to the mining industry and protect our Reef from this dangerous project. Last Friday, GetUp members hand-delivered a giant petition to the Reef Authority in Townsville, urging them to reject the proposal for good. The project will make way for the world's largest coal port at Abbot Point, turning the Great Barrier Reef into a shipping superhighway. Add your name and make sure your voice is heard. 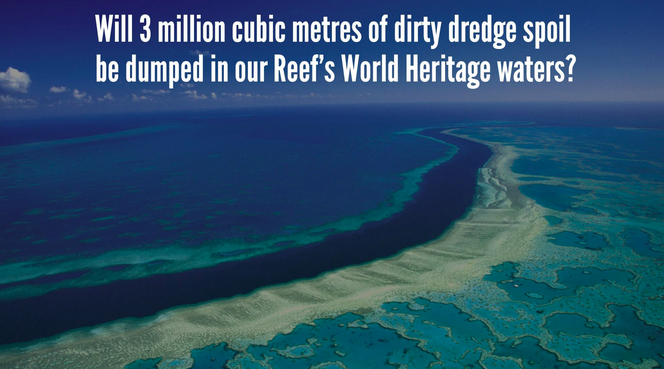 Thank you for making a stand and delaying your decision on whether to allow the dumping of dredge spoil in the Great Barrier Reef World Heritage Area. Now, please reject this risky proposal for good.